Researchers have discovered a previously unknown mechanism for wear in metals: a swirling, fluid-like microscopic behavior in a solid piece of metal sliding over another. The findings could be used to improve the durability of metal parts in numerous applications. "Wear is a major cause of failure in engineering applications," said Srinivasan Chandrasekar, a Purdue University professor of industrial engineering and materials engineering. "However, our findings have implications beyond wear itself, extending to manufacturing and materials processing." The findings are the result of a collaboration of researchers from Purdue, the Indian Institute of Science in Bangalore, India, and M4 Sciences, a company in West Lafayette, Indiana. "Using high-resolution imaging of sliding contacts in metals, we have demonstrated a new way by which wear particles and surface defects can form," said Purdue postdoctoral research associate Anirban Mahato, who is working with Chandrasekar; Narayan Sundaram, an assistant professor at the Indian Institute of Science; and Yang Guo, a research scientist at M4 Sciences. Findings are detailed in a research paper to appear Wednesday (July 23) in Proceedings of the Royal Society A, a publication of the Royal Society in the United Kingdom. 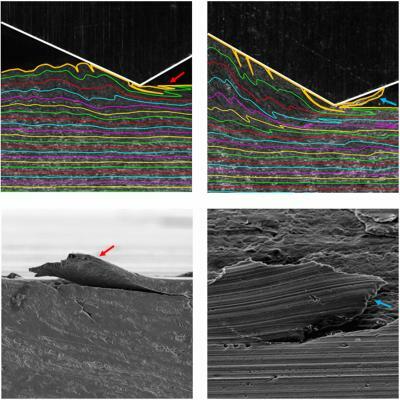 The researchers, using a microscope, high-speed camera and other tools, had previously revealed the formation of bumps, folds and vortex-like features on sliding metal surfaces. The new findings build on the previous paper, published in 2012 in Physical Review Letters, to show how the behavior leads to cracks and wear particles. The findings were counter-intuitive because the experiment was conducted at room temperature, and the sliding conditions did not generate enough heat to soften the metal. Yet, the swirling flow is more like behavior seen in fluids than in solids, Chandrasekar said. The team observed what happens when a wedge-shaped piece of steel slides over a flat piece of aluminum or copper. The metals are commonly used to model the mechanical behavior of metals. "We speculated in the earlier paper that the swirly fluid-like surface flow discovered on sliding metal surfaces is likely to impact wear in sliding metal systems," he said. "Now we areconfirming this speculation by direct observations." The observations show how tiny bumps form in front of the wedge, followed by the swirling movement. When the wedge angle is shallow, the flow is laminar, or smooth. However, it changes to a swirly flow when the angle is adjusted to a less-shallow angle, mimicking what happens in actual sliding metal parts.As the wedge slides across the metal specimen, folds form between the bumps, and then the folds transform into tears and cracks in the wake of the wedge, eventually falling off as wear particles. "A single sliding pass is sufficient to damage the surface, and subsequent passes result in the generation of platelet-like wear particles," Chandrasekar said. The behavior was captured in movies that show the flow in color-coded layers just below the surfaces of the copper and aluminum specimens. The defects range in size from 5 to 25 microns and are similar to those found in sliding components such as parts in automotive engines, compressors and numerous types of equipment and machinery. "In the past we only saw these features after they had formed, and we attributed them to various possible mechanisms," he said. "Here, we show a mechanism for how they are formed. The defect features observed also occur in surfaces created by manufacturing processes like grinding, polishing, burnishing, peening, drawing, extrusion, rolling, and so on, which are all commonly used in making structural and mechanical components in the ground transportation, aerospace, sheet- and wire-metals processing, and energy systems sectors." Ongoing research will explore potential routes to reduce wear arising from this type of mechanism. Metals are made of groups of crystals called grains. Future work will study how a material's grain size and ductility influence this type of wear, how these types of surface defects in manufacturing processes can be eliminated through the modified design of tools and dies, improved models for sliding wear and wear-control strategies. "We want to look at this mechanism in materials that have smaller crystals -- in the 5-30 micron range," Chandrasekar said. "We want to show that the mechanism is more general and extends down to even finer-grained metals." The researchers also have developed a theory and simulation for the mechanism. The work has been funded by the U.S. Army Research Office and the National Science Foundation.